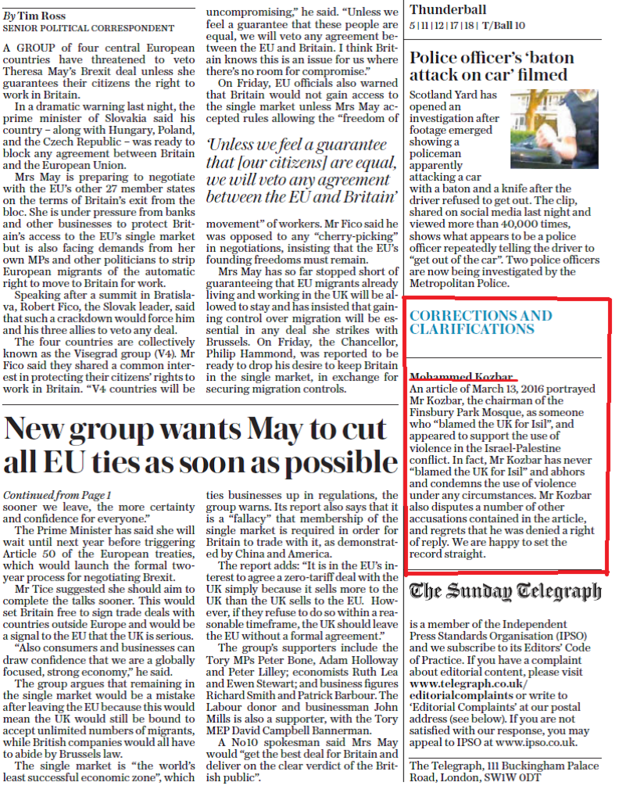 The Sunday Telegraph published a statement on the 18th of September, which set the record straight on insidious accusations made by Andrew Gilligan in an article published on the 13th of March, defaming myself as well as Finsbury Park Mosque of which I am the Director. Whilst I am pleased and satisfied with this conclusion of a 6 month struggle which has affected myself, my family as well as the Finsbury Park Mosque community, I am by no means happy with the state of affairs with certain sectors of the British media and their adherence to standards of accuracy, truth and professionalism. Had I not persevered with an almighty battle which consumed much of my time and effort and drained my family, and had I not enjoyed the backing of the FPM and the local Islington community, the allegations that Gilligan falsely made, would have remained and stuck. The fact that as far as I am aware, Mr. Gilligan was never reprimanded for his false claims, and that until this day I remain denied the right to reply on the pages of the Telegraph, are unacceptable by any means and reflect badly on the state of British Press and the standards of justice, truth and fairness. Many thanks to those who stood by me and Finsbury Park Mosque which will remain in the pursuit of community cohesion, social harmony and equality. The correction in relation to my complaint was published on Sunday 18th September on page 2.